The LifeSense® II capnograph/pulse oximeter offers proven PureSAT® SpO2 and Nonin Medical’s sidestream EtCO2 technologies for a wide range of clinical settings for both intubated and non-intubated patients. Easy-to-use, accurate and cost-effective, LifeSense® II is perfect for SpO2 and EtCO2 monitoring of patients in and outside of the hospital, including procedural sedation, resuscitation, EMS transport and homecare. Instructions: Click on a product name to see detailed information. Some products are only available in conjunction with specific options. Calibration Sensor designed for LifeSense® and RespSense®. Universal Extension Cable is a pulse oximeter accessory. Moisture Trap Filter designed for LifeSense® Pulse Oximeter and Capnography Monitor. Three hole mounting bracket for LifeSense monitor. Nafion premapure tubing, 12 inches long, for the RespSense series. SENS Valve designed for LifeSense® and RespSense®. Verification Gas used to test LifeSense® monitor. Software upgrade nVision® SpO2 data reporting from version 5.1 to 6.3. 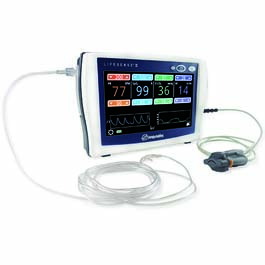 Easy-to-use, accurate and cost-effective, LifeSense® II is perfect for SpO2 and EtCO2 monitoring of patients in and outside of the hospital, including procedural sedation, resuscitation, EMS transport and homecare. Model PSG DAC cable (2.5 mono) for use with LifeSense II and RespSense II. Model PSG DAC cable (3.5 mono) for use with LifeSense II and RespSense II. Model PSG DAC cable (3.5 mono) focablr use with LifeSense II and RespSense II. Model PSG DAC cable (embla) for use with LifeSense II and RespSense II. Carrying case for the LifeSense II and RespSense II.